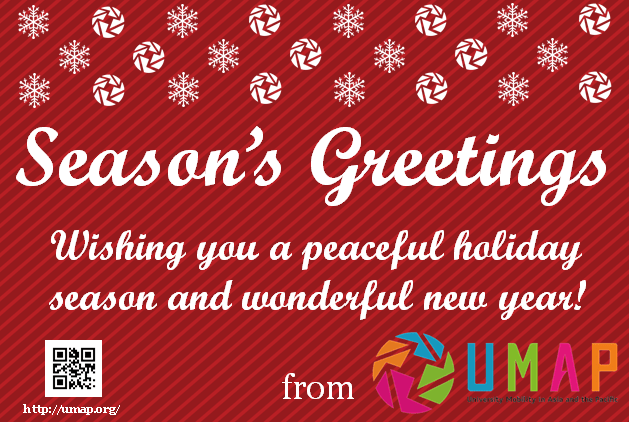 Home >News >International Secretariat >Season’s Greetings from UMAP! 22-Dec-2016 Season’s Greetings from UMAP! Year 2016 marked UMAP’s 25th anniversary. We were fortunate to initiate new activities such as UMAP Discovery Camp 2016, and were also able to hold a symposium to commemorate the 25th anniversary with many of you in the UMAP network as well as our friends and guests. We would like to express our sincerest appreciation to all of our members for your kind support and cooperation over the past year. We wish you a joyful holiday season and prosperous New Year!